Looking for your keys? Cell phone? We can help! I am always asked, what is the latest and greatest tech item today. Watch this video and learn all about our hottest and latest electronics product. Are you that person who is always misplacing keys or your cell phone? Well stop all that frustrating searching with our new Bluetooth item finder. Just download the app on your phone and never worry about losing your items again. 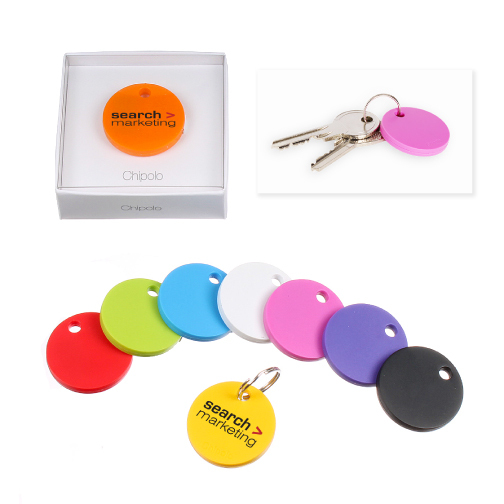 Simply attach Chipolo onto your keys, wallet, bag or pet and with the press of a button on your Smartphone, the Chipolo tag will ring and directions will display on your phone. If you happen to lose track of your phone, shake the Chipolo and your phone will vibrate or ring revealing its location. The Chipolo has a range of up to 200 feet is compatible with both iPhone and Android. Each comes packed in a white box with a clear top and split ring. Custom Colors Available. Custom imprinting always available for as few as 25 pieces.